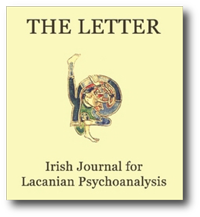 Lacan, at a certain moment in his teaching, seized upon the story of a letter to illustrate how it is that, circulating before the mutism of some and the blindness of others, this letter is the original, radical subject of the unconscious. All of the characters in Edgar Allan Poe’s The Purloined Letter are carried along in an intersubjective game in which each is defined in relation to the most potent character in the plot, – a letter, a signifier, determining and dominating each in turn, subverting the illusion that possession of it entails mastery over it. This is the scenario which Lacan constantly re-presents us with in his work, – a drama in which language is not an instrument which an autonomous subject grasps, as it were, from outside. Here language is, rather, that through which, and in which, subjectivity comes to manifest itself. It is we who are grasped by it. It is in the spirit of that teaching that we now launch our letter, as the servants of language and not its masters. We, therefore, take as our subject the subject of the unconscious and language(s). As such, this letter too is purloined, – taken from the proceedings of the first congress of the European Foundation for Psychoanalysis. This morning I am going to try to approach a topic which has been in the back of my mind for many years and which the theme of this congress and the presence of colleagues from varied linguistic backgrounds has obliged me to consider more explicitly: the position of Irish people with regard to their native tongue and in particular the effect of the position on our patients’ sense of identity and on a practice of psychoanalysis that lays such emphasis on speech and language. It is not a theme that I feel I could approach with any degree of serenity before a purely Irish audience because of the negative reactions that it would almost certainly give rise to. From infant classes up to university entrance, and later in application for state jobs, the national policy of making Irish the spoken language of the country meant that compulsory Irish was a near universal experience for citizens of the Irish republic since the 1920’s and the confusion of tongues resulting from this schooling in a language which had virtually no place outside the classroom came to be seen as a root cause of learning disabilities and other manifestations of psychological distress. There are many ways of approaching this question: until now, it has mainly been presented as being a legal issue, especially when what is in question is primarily the making of new laws in Brussels today. Is it true that a sort of European status of the psychoanalyst is going to be landed on us soon? Are we going to be paying taxes as psychoanalysts (and if so, on what basis)? Don’t we need to be protected against all that? It is not that these questions are either worthless or out of place, but I want to stress that a lot more light needs to be shed on them so that we might arrive at answers which would be of any value. In my opinion, all of these questions arise from the same single mistake: they identify purely and simply the analyst as a citizen, without paying any attention to the fact that such an identification is without foundation and that it is incorrect to pass from one of these qualities, that of being a citizen, to the other, that of being an analyst without noting and underlining the gap separating them. There is an obvious symptom of such a gap, at least for French analysts: no matter which school, group or association they belong to, there is no diploma which qualifies them as psychoanalysts, which clearly means that the state authority doesn’t recognise them as such. I am not trying to assert that all of them are happy with this situation: but as a point of departure we must take note of the fact that numerous generations of psychoanalysts have taken special care not to obtain such diplomas. Why? ‘Zukunft’ -ich habe das Wort in den Titel meines Vortrages aufgenommen, einfach, weil der Begriff der Zukunft derjenige ist, den ich am liebsten und unwillkurlichsten mit dem Namen Freuds verbinde. ‘Future’ -I have used this word in the title of my address simply because it is this idea, the idea of the future, that I involuntarily like best to connect with the name of Freud. The temporality of the human subject as studied by Freud suffers from an internal disproportion that has often been noted but seldom discussed: whereas he describes past time fondly and in detail, his account of future time is foreshortened and schematic. The present in which the analytic subject speaks is poised uneasily for Freud between discontinuous time-worlds. The problem lies not in the fact that past and future are logically asymmetrical, but in the seeming flatness that afflicts one of them: the past has character, but the future has none. Romancing the matter only a little, we could say that for Freud the past is ‘a character’, while the future is a cipher and something of a bore. The very first patient described at some length in Freud’s writings, Frau Cacilie M. or Baroness Anna von Lieben, suffered from an “‘hysterical psychosis for the payment of old debts”‘1. All these old debts had been accumulated, he indicated, by her making false connections in the past: her neurotic symptoms were masks, excessive stories, covering over the true and hidden connections, which her cathartic cure would reveal. Getting the true words out, expressing them adequately, in the proper place, to the proper person: this is another way of describing her paying off or perhaps writing off these old debts. The speech emitted can almost be counted off, on one side of the balance sheet, against the debt, the past obligations, represented, as if they were old IOUs, by symptoms. The German word Freud used to describe his patient is a wonderfully rich and ambiguous term: “hysterische Tilgungspsychose”. Tilgung means the deletion sign in typography; tilgen means ‘to extinguish’, ‘to strike out’, ‘to wipe out, to efface’, ‘to delete’ (in typography); Schuld tilgen, means ‘to pay, compound, discharge, cancel’; Anleihe tilgen means ‘to redeem’, so that Tilgungschein means ‘certificate’ of redemption’. Anna von Lieben spent much labour redeeming all her old debts, issuing certificates of redemption through the hard work of catharsis she accomplished with Freud. It took her three years, Freud writes, of the talking cure to redeem the old debts of thirty-three years. To cede the initiative to words is the task of the artist according to Mallarme. In a more sinister context this dictum could also be said to describe the obscure directive which immobilizes the psychotic. In the last part of his great trilogy ‘Molloy’, ‘Malone Dies’, ‘The Unnamable’, Samuel Beckett has managed to subsume this second terrible imperative within the first, artistic one, and in doing so has created a novel which is one of the most extraordinary achievements of our time. According to Oscar Wilde, “education is an admirable thing, but it is well to remember from time to time that nothing that is worth knowing can be taught”. What is worth knowing has a special place in the discourse of analysis and it is something that is difficult to transmit. In psychoanalysis, knowledge, S2, is related to truth; it occupies the place of truth in its discourse and it is the only knowledge with which it is concerned. Mindful of the theme for this Congress “The Subject of the Unconscious and Language”, I wish to confine this communication to a clinical demonstration -yes, in the way physicians demonstrate clinical signs -a demonstration of the action of the signifier on the subject. The signifier, as we know, is any inert element of language which unconscious meaning borrows to communicate itself. When a neurologist, let’s say, wants to demonstrate a palsy or a paralysis of the seventh cranial nerve, which journeys from the base of the brain through the skull to serve the muscles of the face, he asks the patient to smile and there will be a drooping of the mouth on the side of the paralysed nerve, confirming the palsy. In psychoanalysis, paralysis of the action of the signifier has equally devastating results. But unlike a nerve which can be irreversibly damaged, the signifier which cannot be destroyed, can be specifically activated in analysis, to undo a certain spancelling of the subject. If you have seen Arnold Schwartzneggar in the movies about “The Terminator”, the indestructibility of this machine which masquerades as a man, will give you some idea of the durability of the signifier. If, as Lacan says in his Seminar of 1972, Encore, to understand any discourse whatsoever we have to begin with the enunciation that there is no sexual rapport and that from this all other discourses will follow, then this enunciation has profound implications for the jouissance of the mystic. In fact the mystic completely subverts the notion of a discourse because the mystic introduces us into a new kind of knowledge of the Truth about the Reality of Being and so, in a certain way there is no more to be said -but me -myself -not being a mystic I will continue to speak! The mystic is on the side of being-and he knows that where there is Being there is a desire for Infinity. The mystic knows that in Truth there is a price to be paid for Being. St. Teresa of Avila knew this. She knew that she had to be saved and that it was only God who could do this “I do not think that you left anything undone to make me Yours, entirely even from my youth”. Claudel! Why Paul Claudel? In a seminar entitled Transference, where Lacan introduces his long extrapolation on ClaudEl, the issue ought to be, after all, transference. I am referring, of course, to his Seminar VIII (1960-61) that goes by that single-word title. The long meditation on Plato’s Symposium with which the Seminar begins already seems far-fetched enough until one realizes that Lacan is using Plato’s famous dialogue on love as a means of discussing love in psychoanalysis, i.e., transference love. In these terms, the analysis of Alcibiade’s relationship to Socrates as a transferential one that Socrates handles in model fashion is both pertinent and illuminating. But Claudel? What can he tell us about psychoanalytic transference? Paranoia is above all linked to our representation of space, because spontaneously our representation of space is Euclidean, which has been the natural geometry for centuries. We continue to think according to the rules of this geometry, and there has been an effort made by rationalism to assimilate the rules of thinking to the rules of this geometry. But this Euclidean geometry is based on the existence of closed figures, that is, an isolation of what is inside from what is outside. Here is an absolute boundary between the inside and outside (the circle) which is the basis for paranoia. People have questioned themselves for a long time about the materiality of the line, and that is why geometricians say that it is a line without thickness. But in so far as it separates the inside from the outside, we can say that it is a cut or a cutting. What gives meaning to the Euclidean surface is this cutting. Lacan has this very surprising formula: he says that the surface is the cut.